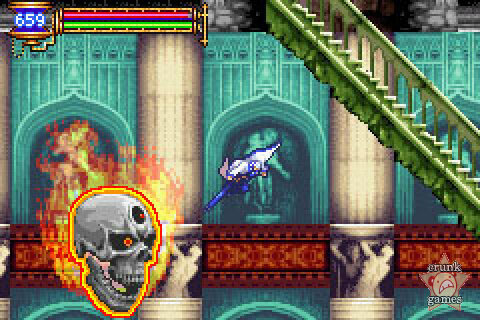 The next Game Boy Castlevania scores Konami a well-deserved hat trick. 21st century high-schooler Soma Cruz finds himself inside Drac’s castle and battles to find a way out. It’s been a good couple of years for Castlevania fans. Sure, it’s a tiny bit disappointing that all the new ones are coming to the GBA, but they’re making one for the PS2 now, so quiet down. 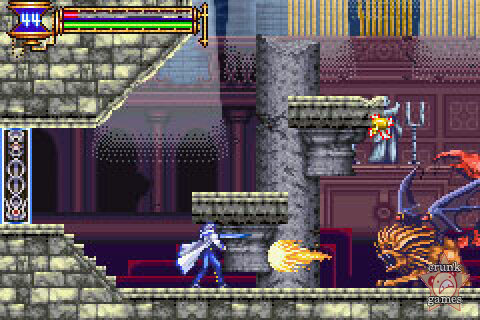 Thanks to the minds behind Symphony of the Night, we now have a second stellar Castlevania that you can just happen to play anywhere. Aria of Sorrow opens in 2035 and focuses on the life of Soma Cruz, a platinum-haired kid spending some time abroad in Japan. He’s on his way to catch the first solar eclipse of the new millennium when he blacks out in the middle of it. He wakes up and finds himself in a huge castle. Woken up by his supercute childhood friend Mina (if they’re childhood friends then why is Soma an exchange student? ), he’s then greeted by a mysterious man named Arikado (!!! 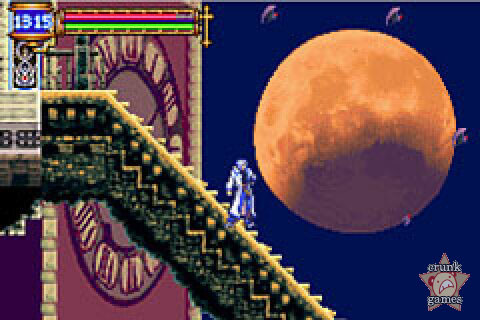 ), who tells him he’s inside Dracula’s castle, which is inside the eclipse itself. Eventually it’s learned that Soma carries dark powers and that he must find clues to why he’s been brought to the castle and vanquish the hidden evil yada yada yada. At least you get to start beating things up soon. As Soma makes his way through the castle, he runs into more people who are trapped with him, including (but certainly not limited to) the sultry Yoko Belnades (!!!) and soldier-turned-merchant Hammer. The game doesn’t really touch on why all these people are running around the castle with Soma, they’re just kind of there to confuse him endlessly. And even though he’s not exactly a hardened vindictive sort like the Belmonts, Soma’s cheerful greetings and overly trusting attitude towards people just seems a little uncharacteristic for someone who’s trapped inside Dracula’s castle which itself is inside a solar eclipse. Maybe it’s something in the hair bleach. Graphically, Aria is not too far removed from Harmony of Dissonance. Scratch that, it isn’t removed. There are hints of improved animation (in Soma’s case especially) and heaps of sprite rotation, but not much else is new. The intro even borrows the same scrolling text device! But after all, the releases between the two games were barely a year apart and Aria keeps up the tradition of being pretty, so it’s not exactly depressing. 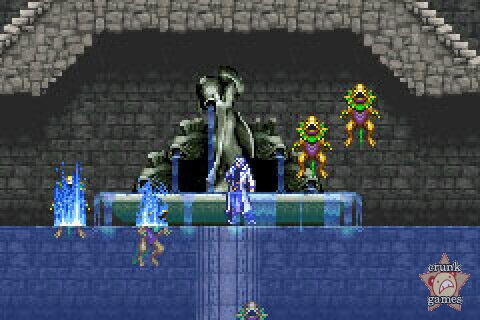 As far as the music, Aria sheds the bloopy 8-bit reliance of Harmony for a more current-sounding score. It’s still not all that memorable, but the important thing is the music is competent and shouldn’t have you playing in silence like with Harmony. 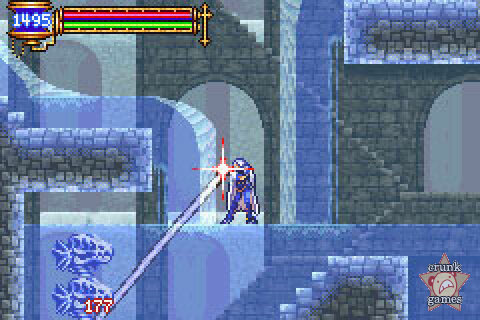 Unsurprisingly, Aria is the same ol’ RPG-style Metroid-ish game that Castlevania has always been for about six years. It’s been said that the game is shorter and easier than Harmony of Dissonance and even Circle of the Moon, and indeed it will always be a cinch to gain experience, but there will also be the one or two bosses that will require some old-school pattern studying. Hey, it’s still fun and satisfying, so you won’t see us complaining. Aria presents its system of acquiring skills in the form of soul collecting. Apparently Konami realized that no Game Boy game is complete without some interpretation of monster collecting, so Soma will randomly come across monster souls on his journey. There are three categories of souls: red ones are all offensive attacks based on creature it came from, blue ones improve your stats and add abilities, and yellow ones add some more abilities and yes, better stats. It actually kind of makes the game feel a little more like Symphony of the Night and is generally more convenient than the traditional "getting a subweapon but having to forego the last one" sort of thing. Also, because of the random nature of gathering souls, you can freely trade them with a friend’s copy of Aria and help each other through collecting the lost spirits of the evil dead. Good stuff.